← Hello Kitty x Tokidoki x Pullip Collaboration Announced! I have somewhat of a love/hate relationship with Rozen Maiden these days, don’t get me wrong I love the series but it ended up being somewhat of a Pandora’s box for me. The series renewed my interest in anime and it got me buying anime figures again… and it also led to my starting to collect these odd dolls with disproportionately large heads called Pullips. If only I knew then what I know now, eh who I am kidding I have no regrets I do it all over again. Jun Planning (Groove’s forerunner) collaborated with TBS to release a series of dolls based on the likenesses of various characters from Rozen Maiden. 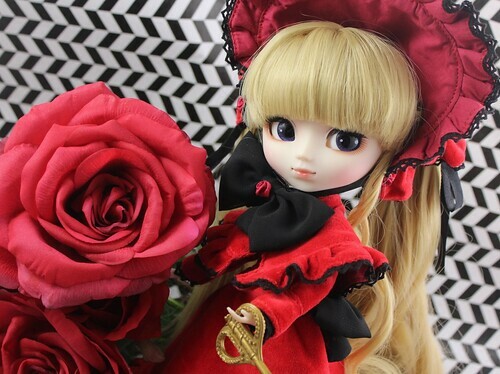 Rozen Maiden was the first major collaboration for Pullip, since then Pullip has collaborated with Tokidoki, Sanrio, H.Naoto, Baby, the Stars Shine Bright among many others. Eventually nine dolls were released including Pullips Shinku, Suiseiseki, Souseiseki, Suigintou & Barasuishou; LE Pullip Detective Shinku & Kirakishou and Dals Kanaria and Hina Ichigo between 2006-2008. 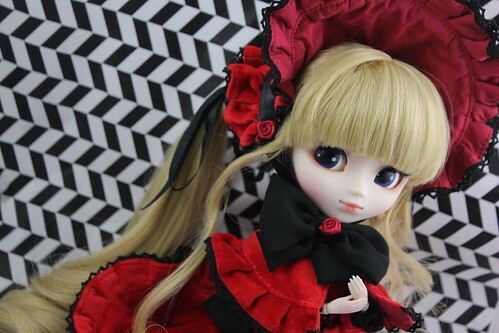 Shinku was my first Pullip, I received her as a birthday present I had wanted Dal Hina Ichigo as she was my favorite character as my first but the not quite Mr. Klein bought me Shinku instead. 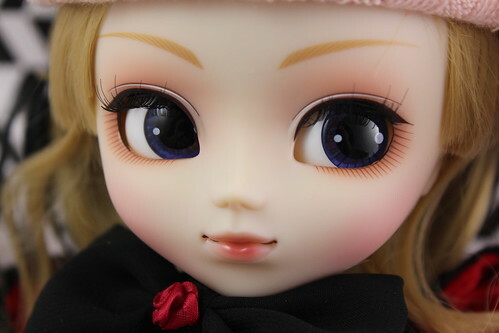 I liked her so much that I ended up ordering Suiseiseki myself that night from Pullipstyle. Last year a new Rozen Maiden tv series called Rozen Maiden Zurückspulen aired and Groove has again partnered with Rozen Maiden to release a new series of dolls based on the characters. 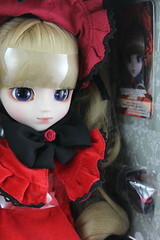 The new version of Pullip Shinku was released in March in Japan, she is being released very shortly here in the US. I’m very fortunate to have a product sample of Shinku from JPGroove to review here. Pullip Shinku’a stock seems to be more be made a bit more nicely this time around, the details on her stock are all really lovely. She looks a lot more refined this time around. Her stock looks much closer to the manga now. She comes with the standard card and stand. While she does come with a key like the original release, she does not come with a Detective KunKun plush or the note that Jun received when he opened Shinku like the original did. There was an exclusive Jun plush available if you preordered during the first two weeks of ordering from TBS shop which you can see here. 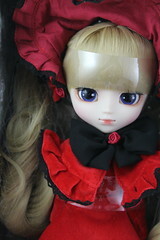 Shinku has a really nice face up I love the rosey hues that used for her face up. I especially love her lips. I’m not quite sure her expression is haughty enough. 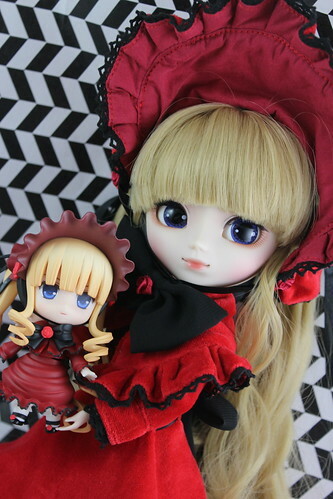 Face up comparison with the original Shinku release, I really like both designs. The newer one definitely seem a lot more like the manga/newer tv series but I think the original is still has my favorite face up of the pair granted I’ve owned the original for seven years now so I could just be more used to thinking of her as the quintessential Shinku. I also feel like the eyechips of the original are a lot more anime-like than the new ones. Shinku has a MSRP of 16000 yen, so she is a bit more expensive than the original release but that was over eight years ago and production costs have gone up everywhere so it makes sense that she would be more expensive. 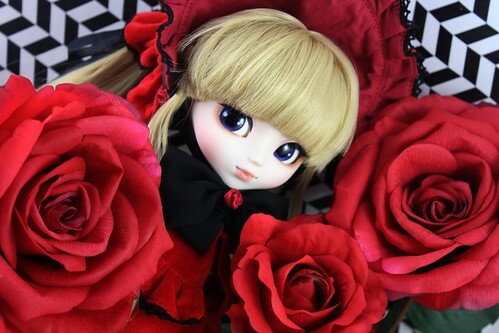 Of course, red roses are the perfect accompaniment to this lovely crimson doll. I will let you be my servant… If you understand, then pour me a cup of tea right now… Feel Like So. 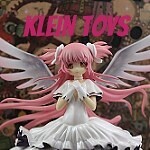 Shinku playing with a toy of her own, the Shinku nendoroid from Good Smile Company. 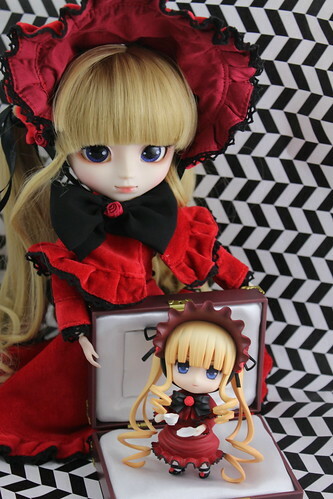 I eventually need the Volks SD Shinku so I can take a picture of her playing with the pullip who is playing with the nendoroid so I can have a whole circle of toys playing with toys. One good thing about the new Rozen Maiden anime series is the flood of new merchandise, I am beyond thrilled that new figures are coming out and that Groove has released more dolls. If you love the anime series and missed out on the original Shinku, I highly recommend getting her. If you haven’t watched the anime series, I highly suggest you do so as if you are reading this chances are you like dolls and well it is an anime series about dolls. 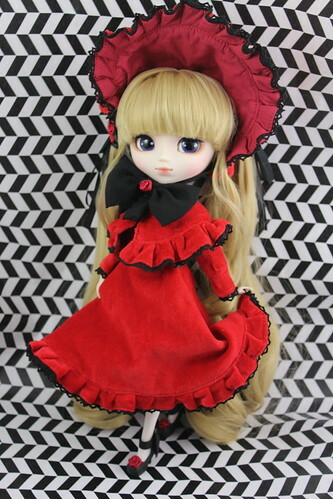 Even if you aren’t familiar with the series, Shinku is a truly lovely doll that would make a great addition to any collection. 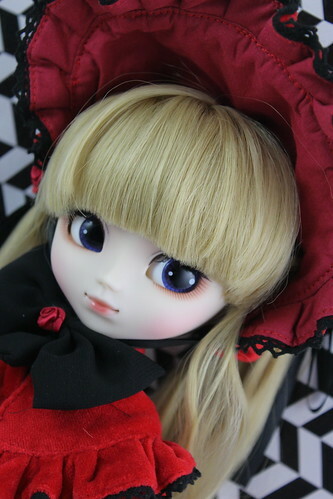 More photos of Shinku are available on my flickr. 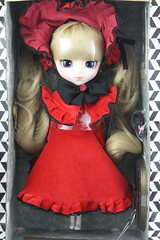 A very special thank you to JPGroove for sending me Shinku and Keikujyaku as sample dolls for review. Both dolls are still available for preorder via Pullipstyle and JPGroove but will be in stock very soon. 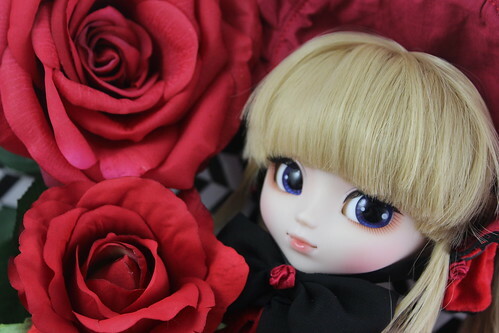 This entry was posted in Doll, Pullip and tagged Pullip, rozen maiden, Rozen Maiden Zurückspulen, shinku. Bookmark the permalink.